Summer wouldn’t be quite right without pots of tomatoes growing by our back door. Most of them get eaten on the way in and out of the door but sometimes a bowl of tomatoes makes it to the kitchen table. 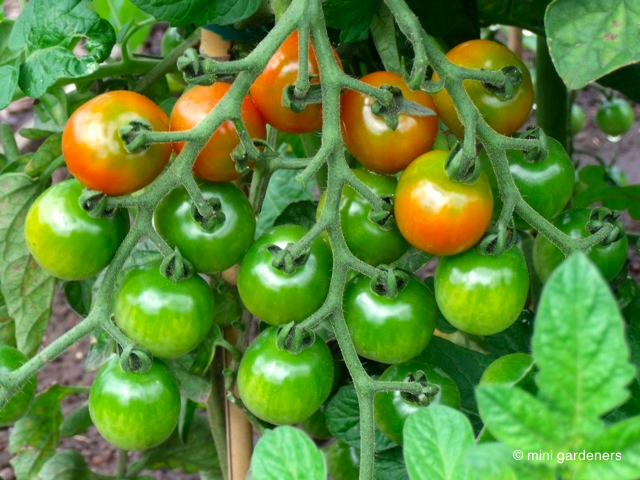 And we grow lots of cherry tomatoes – the perfect size for popping into a hungry mouth on the way out to play. Our favourites are ‘Sungold’ and ‘Gardener’s Delight’ because they’re reliable, heavy cropping and scrummy to eat. 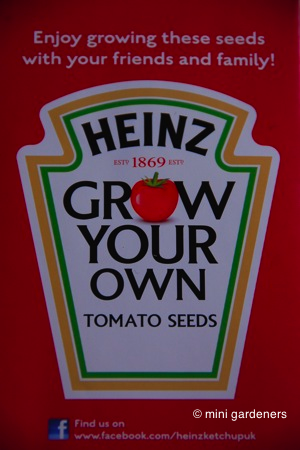 And then last week, the lovely people from Heinz tomato ketchup sent us some ‘San Marzano’ tomato seeds to try. A bit of research revealed that ‘San Marzano’ is an Italian heritage plum tomato with thick walls and not much juice, making it perfect for tomato sauce. Or homemade tomato ketchup. But it won’t taste exactly like Heinz tomato ketchup because they don’t use these particular tomatoes. 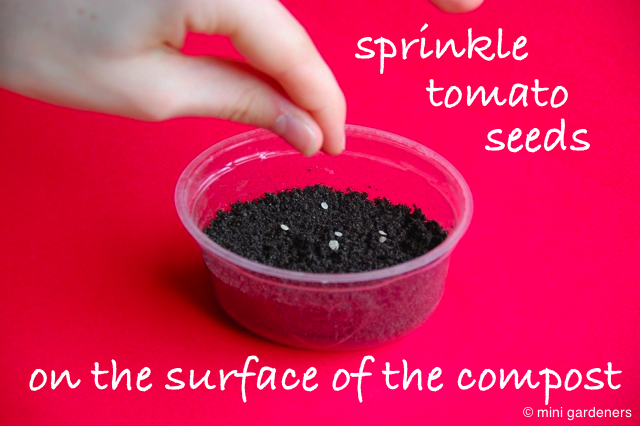 Tomatoes need a fairly long growing season so we did our seed sowing in February and March. But the Heinz seed packet said sow between February and April so we reckoned we could just get them sown in the nick of time. 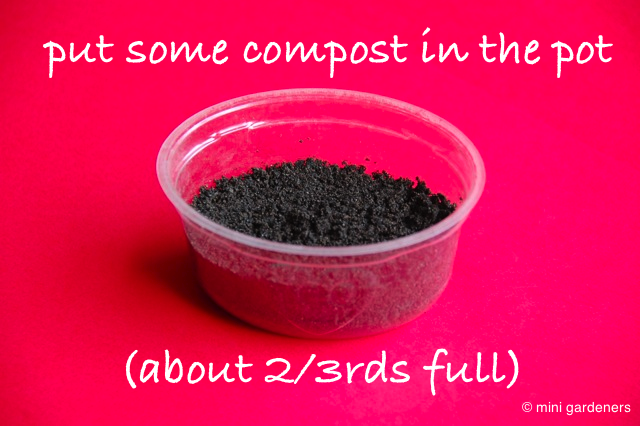 We used seed sowing compost but multi-purpose compost works just fine. 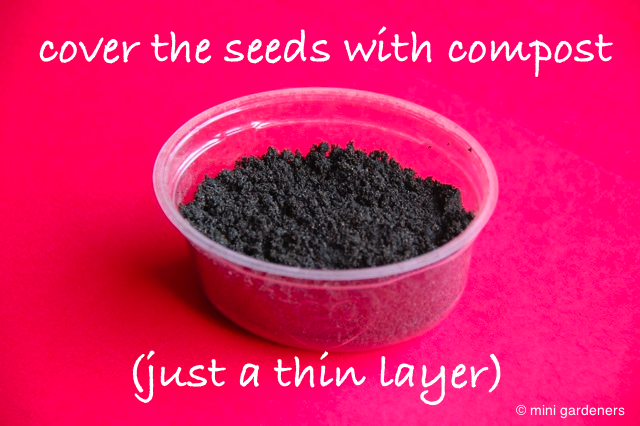 ..and leave until the surface of the compost is moist – this should only take a few minutes. 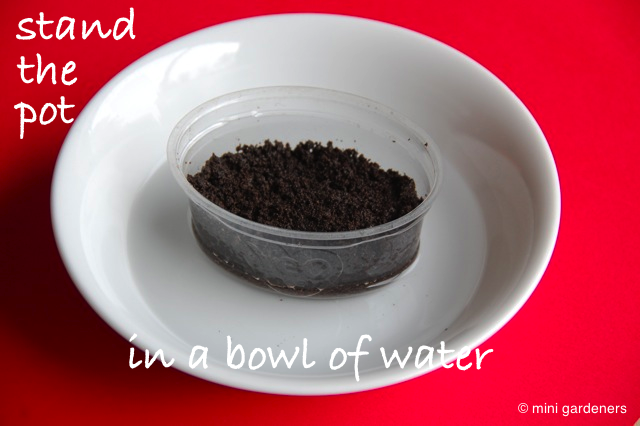 This method of watering is much kinder to seeds; overhead watering, particularly by enthusiastic children, can wash small seeds deeper down into the compost. Tomatoes like a bit of warmth to germinate, hence the cling film. 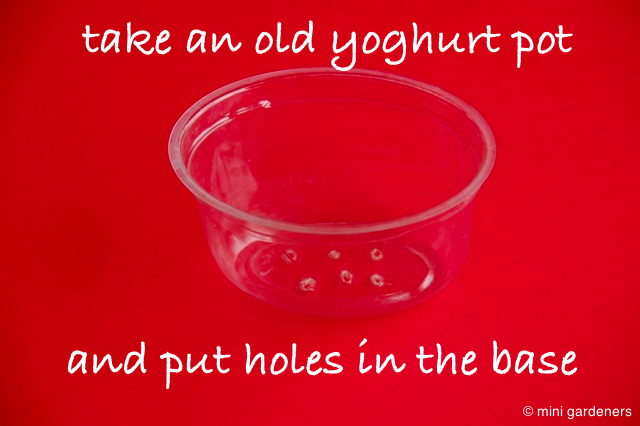 Enclosing the pot inside a clear plastic bag would work just as well. The usual advice is to place the pot on a sunny windowsill but we don’t have any windowsills at the back of the house and the front of the house is north facing. So our pot is now living on the kitchen table as it’s warm and sunny there. 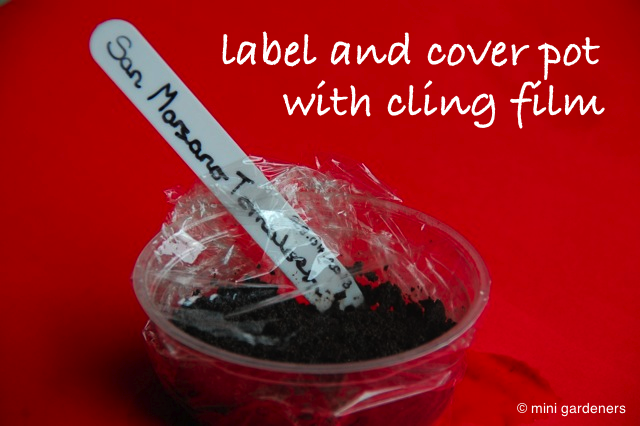 The cling film (or plastic bag) needs to come off as soon as the seedlings push through the soil otherwise they’ll get too warm and grow long and stringy. Given that it’s late April and we’re keeping the seeds nice and warm, we’re hoping seedlings will appear within the next week.